From the seventh chapter BOSS room, come back to the ACT 8 front map Saan city wall, along the city wall in the map will run to find the entrance to the upper wall, go all the way to the end. After coming to the camp, pick up the tasks and follow the path behind the grocers Enter the Toxic Conduits and make your way thru the zone (bottom right-ish?). After entering this map, all the way, find the BOSS room of Doedre’s Cesspool (bottom right again?) to open the BOSS battle. Doedre’s BOSS is divided into three forms. Players can use the valve in the middle cauldron to switch the shape of Doedre’s. Different forms of Doedre’s Cesspool will have different skills. Just remember to switch the valve at any time, it will be easy. It was killed. After defeating Doedre, you will come to collect the corpse. Don’t ignore him. Exit directly from the BOSS room. There will be two forks to the Lunaris Temple and The Solaris Temple. Let’s go to the left to The Lunaris Temple. When you come out from the left, you will come to a big map called The Harbour Bridge, and you will find the entrance to The Solaris Concourse and go in. 1: First go to the middle of the map to find a BOSS that will shield the rush, there is a task props next to him to collect, rewards in general, but because it is done by the way, you can do it directly. 2: This map has the first trial of the labyrinth of the ruthless difficulty. Everyone needs to find it. 3: Take the BOSS room that will be shielded as the starting point, and run all the way to the top/left. You can find the entrance of a map called The Harbour Bridge. Going in and going all the way will meet a BOSS called Yugel, the source of fear. If you die, you can take a little talent, and sin will open a small point for the Pantheon. After you finish it, you will be sent back to the camp to get the reward and send it back to The Solaris Concourse. 4: Still, the BOSS room that will be shielded is seven o’clock. It runs all the way to the right/bottom direction, and you can reach the Moon Shadow Plaza. 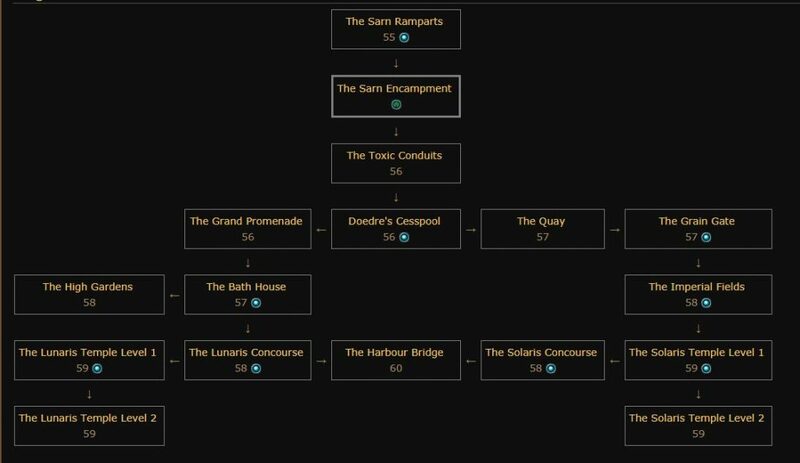 Here is where our ACT 3 killed what the general is called, directly The Lunaris Temple can be found by going up the stairs and continuing up the transfer point. The terrain of The Lunaris Temple is no different from that of ACT 3. The BOSS Moon Shadow ambassador is in the position of Patty before ACT 3 and ran directly to the second floor to kill him. After getting the quest PoE items & Currency, he returned to the city and transferred from the transfer point to The poisonous pipeline, this time running to the right, going to the transit terminal. The transfer terminal has a branch task. First, you need to find a task item in the map. After you find it, you will find an arena in the lower left direction of the map. After you enter, you will open the task. After you finish, you will get a little talent. The exit to the next map, the Gate of Rice, is at the bottom right of the map. This picture of Dahui Huimen is a bit big. There are houses everywhere. There is a branch task that requires you to kill a group of BOSS that will put skills. You can do it or not. When you run the picture, you will be killed. This picture remembers that the house is going in and looking for it. The exit is fixed behind a house. After coming out of Inamori Gate, you will come to the Imperial Plains. After entering, you can walk along the road under your feet to the Solaris Temple. The terrain of The Solaris Temple is also no different from the ACT 3. In the second game, the original Dara’s position was a transmission array. After killing the Japanese messenger, it was completed and the final BOSS day and month were opened. The goddess needs task props. After killing the BOSS of The Solaris Temple, the gateway is directly opened back to the city. After returning to the city, transfer to Moonshadow Square and walk towards the bottom of the transmission array. You will soon find the entrance of the Harbour Bridge. This map is very dense. You think you can brush it up here and go all the way. After resetting the brush back, it was very cool. In the middle of the map, it is the BOSS map of ACT 8 final BOSS day and the moon goddess. After entering the task items, you can start the BOSS battle. The sun and the moon goddess will mix the doubles for a while, as long as you are against them. If anyone causes damage, it will come over to hit you. Two BOSS will fight with you on the court. An invincible AOE skill will take turns to beat you, pay attention to hiding AOE, especially Luna AOE, the damage is very High, need to pay attention. After the fight, the sin will come over to collect the corpse. The goddess of the two goddesses of the day and the moon is quite good. A mob reduces the damage of a BOSS. You can choose it yourself, and then you can go through the exit of the BOSS room. Chapter nine.